Welcome to our school website! You visit us in the middle of a school review - Future@Silverhill; which includes evolving our website...look out for changes towards the end of this academic year. We are passionate about making children feel amazing about themselves every single day! Caring for ourselves, for each other, and for our environment. Using engaging experiences to promote self-esteem and nurture inquisitive minds, passions and strengths. Instilling a culture where we have the highest expectations of everything we do. Valuing creativity, individuality and celebrating every success, no matter how small. We believe our children deserve the very best experiences a school can provide and we know the foundations for that are based on fun & happiness! By living and breathing our 6 values we endeavour to become better people and strive to improve ourselves, each other and hopefully contribute positively to society. Back in June the PTFA Committee met with Mr Gallagher to set out our funding goal for this year, it was decided that we would provide £600 per year group for enrichment activities to bring the children's learning to life. So far we have provided a Wendy House and play guttering for Reception, new outdoor learning equipment for Year 1, some Titanic resources for Year 2 and there are some upcoming visits and special guests that we have paid for in the Juniors (we don't want to spoil the surprise!). It has been so nice to see the money raised by the school community put to use by the pupils and knowing that all our hard work is directly benefiting our children! One of the ways in which we raise money for these activities is our Christmas Fundraising. This year we made a magnificent £3200 in total. This includes the Reception Children's Tea Towels, Personalised Christmas Cards, the Raffle, Santa's Grotto and of course our wonderful Christmas Enterprise Fayre. The Junior classes that took part did an amazing job, the ‘Dragons’ were so impressed with their professional approach to pitching and invested in all of the ideas. In total the enterprises raised £395.96 which was passed directly back to the classes to choose how to spend. The ultimate winners were Barn Owls who ran a variety of stalls and made £67.40 profit! To help us to continue raise funds the PTFA has purchased a shed, this will be used for both storage and to provide refreshments at outdoor events, such as sports day, we hope that this investment will make a real impact on the way we fundraise. 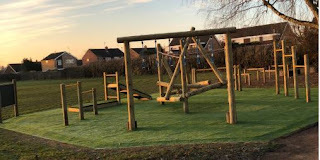 You may have also noticed that the new climbing area has now been completed in the Junior Playground, this was spearheaded by our previous Chair Julie and has made a massive impact on the children's free times. In total the PTFA contributed £3500 to this project - definitely money well spent, thank you all for making it possible! As always, the PTFA is open to new ideas, if you'd like to get involved or find out more then please drop us a message via our Facebook page or email us at silverhillptfa@gmail.com.